در جراحی لاپاراسکوپی، امکان لمس مستقیم بافت‌‌های ناحیه جراحی برای جراح وجود ندارد و در نتیجه جراح نمی‌‌تواند با استفاده از حس لامسه، رفتار مکانیکی بافت را ارزیابی کند و وضعیت سلامت یا بیماری آنرا تمیز دهد. علاوه بر این مشخصات بیومکانیکی بافت‌های نرم داخل شکمی در حالت زنده از جمله داده‌های اصلی مورد نیاز برای نرم‌افزارهای شبیه‌ساز جراحی هستند. این پژوهش به منظور طراحی و تحلیل ابزار رباتیکی جدیدی انجام شده است که بتواند با گرفتن و فشردن بافت‌های نرم و حجیم درون شکمی داده‌های نیرو- جابه‌جایی آنها را استخراج کند. ابزار طراحی شده همانند دستی رباتیک با دو انگشت است که با استفاده از یک مکانیزم متواز‌‌‌ی ‌الاضلاعی باز و بسته می‌‌شود. به منظور جلوگیری از حرکت افقی انگشتان و عدم لغزش ابزار روی بافت در ناحیه تماس، از یک مکانیزم ترکیبی با دو لغزنده مرتبط و یک بادامک جبران‌‌ساز استفاده شده است. نتایج تحلیل سینماتیک نشان‌‌دهندة کارایی مکانیزم طراحی شده برای حرکت خالص قائم انگشتان به صورت موازی با یکدیگر است. همچنین نتایج تحلیل دینامیک پس از بهینه‌‌سازی ابعاد مکانیزم حاکی از نیروی عملگر حداکثر 65 نیوتن برای اعمال نیروی فشاری 10 نیوتنی به بافت است که در زوایای میانی بسته شدن ابزار رخ می‌‌دهد. During laparoscopy surgery, the surgeon cannot touch the tissues directly by his/her hand. As a result, he is not able to use tactile sensing for evaluating the tissues’ mechanical behavior and diagnosing their normal/pathological conditions. Furthermore in vivo biomechanical characteristics of Intraabdominal soft tissues are among the main data required for surgery simulator softwares. The purpose of this research was to design and analyze a robotic surgical instrument which could grasp and compress the intra-abdominal large soft tissues and provide their force-displacement characteristics. The designed device is analogous to a robotic hand with two fingers, which are opened and closed using a parallelogram mechanism. A combined mechanism, including two connected sliding links and a compensatory cam, are used to prevent the fingers horizontal motion and keep the contact area fixed. The results of the kinematics analysis indicate the efficacy of the designed mechanism to provide pure vertical motion in fingers, parallel to each other. Also, the results of dynamic analysis indicate that, after dimensional optimization, the maximum force required at the actuator is 65 N, to apply a 10 N compressive force to the tissue at the middle of grasping range. V. Gupta, N. P. Reddy, and P. Batur, "Forces in surgical tools: comparison between laparoscopic and surgical forceps," in Engineering in Medicine and Biology Society, 1996. Bridging Disciplines for Biomedicine. Proceedings of the 18th Annual International Conference of the IEEE, 1996, pp. 223-224 vol.1. Soper, N.J., Clinical Updates. Laparoscopic General Surgery: Past, Present and Future. Surgery, 1993. 713(1). Wesrwoodetai, J., In vivo measurement of solid organ visco-elastic properties. Medicine Meets Virtual Reality 02/10: Digital Upgrades, Applying Moore's Law to Health, 2002. 85: p. 328. Brouwer, I., et al. Measuring in vivo animal soft tissue properties for haptic modeling in surgical. in Medicine meets virtual reality. 2001. Nava, A., et al., Determination of the mechanical properties of soft human tissues through aspiration experiments, in Medical Image Computing and Computer-Assisted Intervention-MICCAI 2003. 2003, Springer. p. 222-229. Brown, J.D., et al., In-vivo and postmortem compressive properties of porcine abdominal organs, in Medical Image Computing and Computer-Assisted Intervention-MICCAI 2003. 2003, Springer. p. 238-245. O'Hanley, H., et al., Design and testing of a three fingered flexural laparoscopic grasper. Transactions of the ASME-W-Journal of Medical Devices, 2011. 5(2): p. 027508. Oshima, R., et al., Assemblable Three-FingeredNine-Degrees-of-FreedomHand for Laparoscopic Surgery. Mechatronics, IEEE/ASME Transactions on, 2010. 15(6): p. 862-870. K. Vakili, "DESIGN AND TESTING OF A PRESSURE SENSING LAPAROSCOPIC GRASPER," in Design of Medical Devices, DMD2011, Minneapolis, MN, USA, 2011. R. Oshima, T. Takayama, T. Omata, K. Kojima, K. Takase, and N. Tanaka, "Assemblable Three-Fingered Nine-Degrees-of-FreedomHand for Laparoscopic Surgery," Mechatronics, IEEE/ASME Transactions on, vol. 15, pp. 862-870, 2010. T. Takayama, T. Omata, T. Futami, H. Akamatsu, T. Ohya, K. Kojima, K. Takase, and N. Tanaka, "Detachable-Fingered Hands for Manipulation of Large Internal Organs in Laparoscopic Surgery," in 2007 IEEE International Conference on Robotics and Automation, Roma, Italy, 2007, pp. 244-249. Mirbagheri A, Farahmand F. A triple-jaw actuated and sensorized instrument for grasping large organs during minimally invasive robotic surgery. 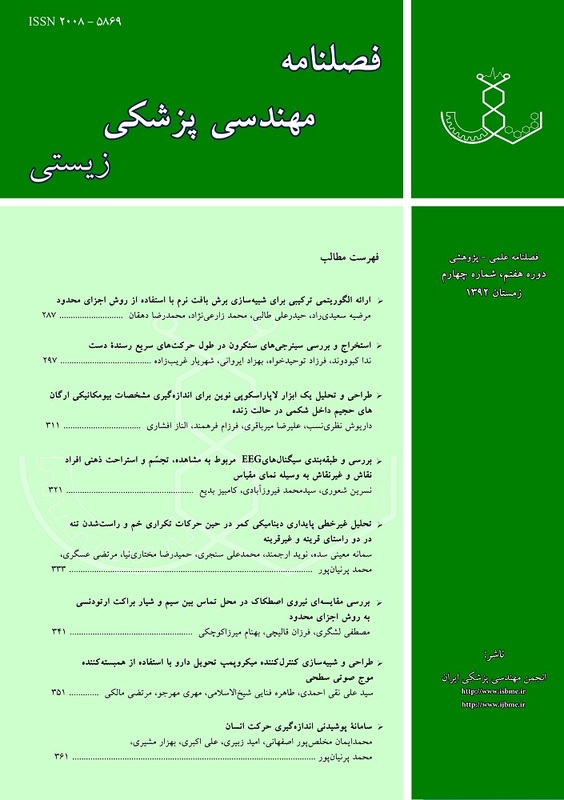 International Journal of Medical Robotics and Computer Assisted Surgery. 2013;9(1):83-93.